Please use the form below to submit your review. Visit Blue West Villas and experience the fun and self-catering holiday villas. Blue West Villas are a self-catering holiday villas located on the west side of Viti Levu and in the midst of the Coral Coast Region. This accommodation offers a tropical setting and it is a magnificent place to indulge yourself for a relaxing holiday. These self-contained villas cater for couples and families. Each Villa has two bedrooms, fully equipped kitchen, balcony, en suite shower, TV; telephone, in room safe, hair dryer and bathroom amenities. There is a restaurant and bar and also a supermarket if someday you would want to cook for yourself. There is a public beach within walking distance. Free use of snorkeling gears is provided. All accommodation villas are beautifully nestled around the garden and pool area. Time frame is about 1 hour and 30 minutes transfer away from the Nadi International Airport, through tropical countryside and quaint local villages. This accommodation is one of the only accommodation in the area that offers Self-Catering Villas. Whether by tour bus or on your own adventure, head inland along the west bank of the Sigatoka river. Either side of the road are the patchwork of flat green fields growing the crops that give the Valley its nickname: "Fiji's Salad Bowl." Along the way are the villages of Lawai and Nakbuta, who welcome guests and offer handicrafts and pottery for sale. The drive past Nakbuta is not for those who suffer from vertigo, as the road climbs steeply along a narrow ridge, but the reward is a panoramic view across the winding Sigatoka Valley with its quilt-like fields to the right. The road then winds to the valley floor and Sigatoka Agricultural Research Station, a popular spot for picnic lunches. From here, the roads get rough and are strictly for the four wheel drives, but even for those who turn back, this trip is a once in a lifetime glimpse at the real Fiji. Sigatoka Sand Dunes National Park. The Sigatoka Sand Dunes National Park is located at the mouth of the Sigatoka River. The extensive dune system extends for several miles along the coast with dunes reaching heights of 60m (200ft). Fiji’s first National Park, this is also an archaeological site where pottery some 3000 years old has been uncovered by the shifting sands, alongside stone tools and human remains. The curious should drop into the Visitor’s centre to learn more about this unique natural location. Kula Eco Park Just off the Queen's Road opposite the Outrigger on the Lagoon Fiji, Kula Eco Park is Fiji's only wildlife park. The park is a cool green forest nestled in a small valley. The trees have names like Dawa, Ivi, Vutu and Vesi and tower above the valley floor filtering the sun. Visitors will hear the call of barking pigeons, the shrill of honey eaters and the constant, pulsing concert of unseen forest dwellers. This is the wild side of Fiji So far, the Park's efforts at sustainable ecotourism have been successful. They have recently been involved in the captive breeding of Fiji's peregrine falcon and crested iguana. In addition, the education program for school children has seen the "graduation" of over a thousand members. 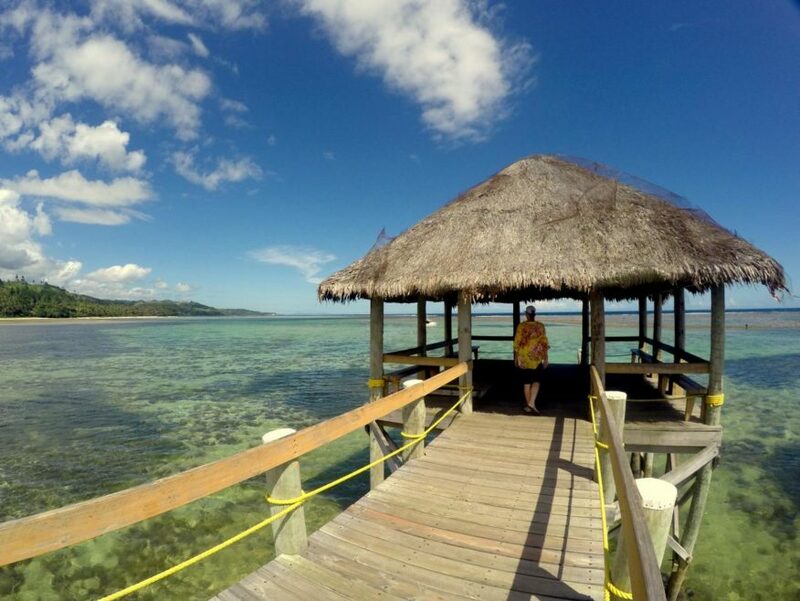 Established in the late 80s and purchased by Kula Eco Park Management 1997, today the park is the an environmental showcase of the South Pacific. History Korolevu, on the Coral Coast, is the birthplace of Fiji tourism. A brilliant stretch of white beach dotted by copious lush vegetation, popular back-packers, hotels and resorts still line its beautiful shore. The place that started it all is the Korolevu Beach Hotel. Built in the 1950s by pioneer hotelier Bill Clarke on 76 acres of prime real estate, it was an immediate hit with the colonial expatriates of Australia, New Zealand and the United Kingdom. Korolevu is believed to be the first place where individual bungalow-style units were called "bures.” Clarke was also the pioneer of cultural shows to educate guests about the local lifestyle. Long since closed, the Beach hotel’s legacy is a still-thriving tourist industry as guests continue to arrive, drawn by Fiji’s natural beauty and Fijian’s natural hospitality. A spacious villa with fully equipped kitchen, living area, balcony. These villas have pool and garden views. Each villa has fully equipped kitchen with two bedrooms and a separate living room. The villa has a balcony, TV, telephone, air conditioning, ceiling fan, ensuite shower and bathroom amenities. We only take a small deposit now and you pay the balance will be paid to Blue West Villas upon the day of check-in. As soon as you book we'll send you an "Order Pending" email to say we have received this. We then book your trip (as fast as humanly possible) then send you a second "Order Confirmed" email with all the important details of your trip, pick up times, booking reference number etc. You'll need to print the second email out and bring it with you. Check in is from 2.00pm on the day of arrival and check out by 11.00am on the day of departure. which is equivalent to one nights’ accommodation charge. night’s rate based on the best available nightly rate. This is payable direct to the Resort at the applicable rate. If cancellation is made 9 days prior to arrival no cancellation fees apply. If cancellation is made within 9 days from arrival – 100% of total estimated accommodation charges as booked will be charged. NO SHOWS will be charged 100% of total estimated accommodation charges as booked. In cases of Early Checkouts, all unused room nights will be charged as early departure fee and if pre-paid then deposits are non-refundable.